Update: I've added a page with always up-to-date tax revenue as a fraction of GDP data along with expenditure, deficit and total debt data as well. I wandered into the opinion pages of the Wall Street Journal and New York Times in recent days where former OMB director David Stockman and economist Arthur Laffer (of curve fame) were both talking about marginal tax rates, revenue and spending. It's always a popular topic, but it's also incredibly difficult to decouple all the components that influence these measures. Complex systems seem to offer lots of opportunity for cherry picking data and ignoring confounding variables. In the end more questions were raised than answered for me. To start with, both of these pieces cited income tax revenue as a fraction of GDP but looked only at a snapshot of the measure or at some subset of the whole. After reading both I really wanted to see what US tax receipts as a fraction of GDP looked like from 10,000 feet. Below are two charts created with data from annual US Census Statistical Abstracts highlighting the period from 1950 through 2009. Just for reference, 1% of GDP is about $143 Billion today. The thing that stands out to me from the chart above is the relative stability of tax receipts over the past nearly 50 years. The federal government has collected between 15%-20% of the nation's Gross Domestic Product every year since 1960. That's pretty remarkable given the wild changes in marginal tax rates and income distributions we've seen over the same period (not to mention all the booms and busts). When normalized with GDP, it's hard to argue that there is any secular trend higher or lower over this time. Looking at the components of the revenue is illuminating as well. 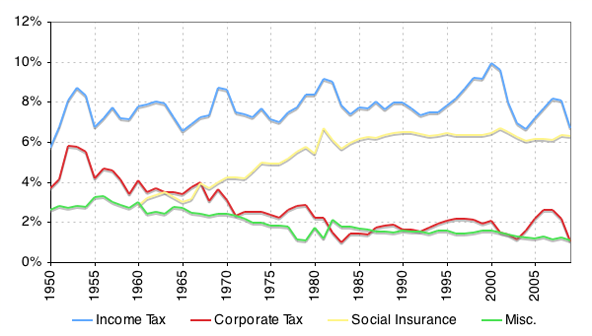 The rise of Social Security tax revenue seems to neatly offset the decline in corporate tax and the miscellaneous taxes over the years. Personal income tax, always the largest source of federal revenue, also seems pretty range bound (albeit with a good deal of volatility). It'd be interesting to try to disentangle the effects of income, employment levels and marginal tax rates here. It's clear, however, that overall economic health plays a large role in how much income tax is collected. Peaks and troughs seem to correspond with recession start and end dates from visual inspection. Note: I've created a chart for government spending as a fraction of GDP as well. Update: Barry Ritholtz shows the trends in the overall and corporate tax revenue. He gets it almost exactly right. 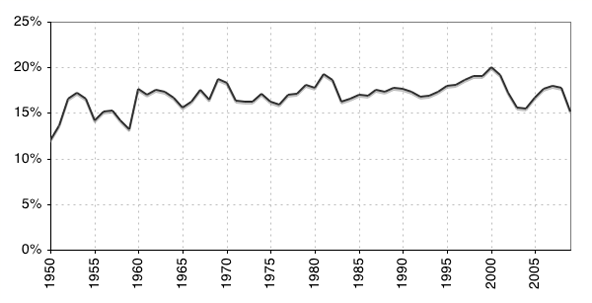 The total tax revenue as a fraction of GDP since 1950 averages 16.9%. Barry also points out the declining corporate tax fraction which got me thinking about the global corporate tax environment. The US already has a relatively high corporate tax rate. This leaves us in a real bind when corporate profits are surging while individual incomes (not to mention jobs) are not.